Our CAKE events celebrate and bring together a broad range of disciplines, expertise and knowledge to discuss current and emerging challenges and opportunities. 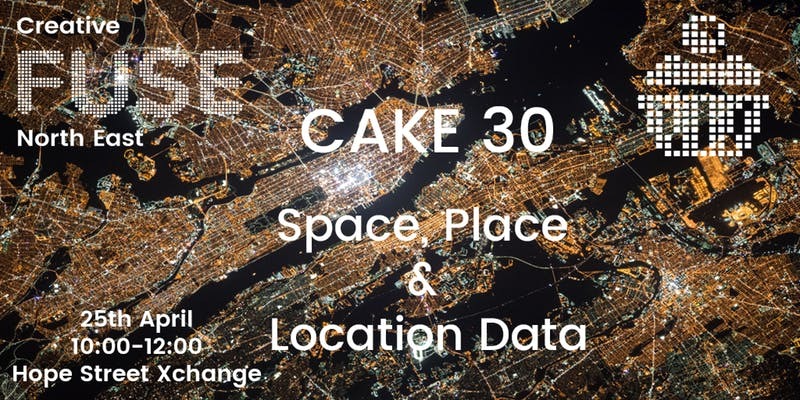 CAKE 30 is a particularly good example of this – we will be exploring how place and location-based data increasingly impacts on how we go about our daily social and working lives and what this means for our communities. The event will focus on how data – smart, and at scale – is enabling new products and services, and new approaches to collaboration and understanding, helping to improve productivity, opportunity, resilience and wellbeing. CAKE 30 will explore what is currently happening across our region and beyond at the intersection of creativity, innovation and technology. Come join us for an opportunity to learn about, explore, and discuss exciting innovations and new opportunities in place and location data across academic, business, and creative settings. And, of course, cake!